Windows 8/8.1 users usually keep the data safety through disk cloning, and the best free Windows 8/8.1 clone software AOMEI Backupper Standard is acclaimed by clients. Windows 8/8.1 OS has been widely used since Microsoft released them. Many people try to find a free clone software for Windows 8/8.1 to clone the hard drive disk or system in order to protect the data’s safety. Actually, cloning Windows 8/8.1 can solve a lot of troubles for users. Such as hard disk upgrade, data migration, making a disk duplicate, data recovery, etc. Cloning with a powerful software does really simplify matters. There are many software on the market. Comparing with the functions and price, the best clone software is belonging to AOMEI Backupper Standard which has a feature called “Clone”, what’s the most important, it is free and it is very suitable for personal computer users or small and medium companies. It can clone disk, system, partition free for Windows 8/8.1. Here we can see the the main interface of AOMEI Backupper Clone. Disk Clone: this feature of AOMEI Backupper can clone disk for Windows 8/8.1 freely. If you want to copy all the data on the disk, this feature is suitable for you. Even if you want to upgrade the current HDD, or change a new one, Disk Clone can clone one disk to another one and it won’t interrupt your working. System Clone: this feature is designed for cloning or migrating the system to solid state drive(SSD) or other disk. If you want to migrate your Windows 8/8.1 operating system from HDD to a SSD to optimize its performance, System Clone will help a lot. (if you are the first time to download and use AOMEI Backupper Standard, you need to unlock it-just share this software on your social media). 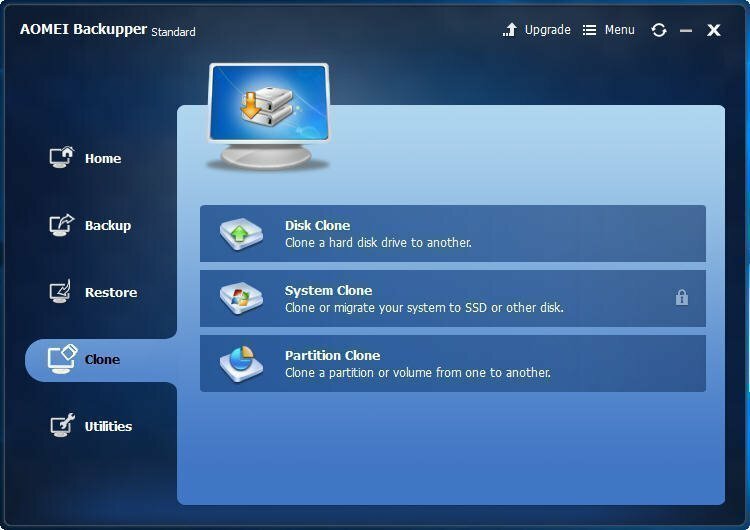 Partition Clone: Partition Clone allows users clone a partition or volume in single. You can clone a partition or volume from one to another local partition, or external drives. If you are going to clone Windows 8/8.1 to SSD, you can align partition for SSD to optimize its performance. But, no matter cloning disk, or system, or partition, as only as with AOMEI Backupper, it will be simpler and easier. Here takes an example for you to show the specific steps of using this freeware to clone Windows 8/8.1 disk. Before you do, you need to prepare a hard drive which is enough to store the data on the disk. Step1.Launch AOMEI Backupper, click Disk Clone under the Clone tab. Step2. Select the disk you want to clone and click Next. Step3. Select the destination disk you have prepared before. It could be another local disk or external hard drive. Click Next. Step4.You can confirm the clone information. In this window, you can setup more. On the bottom, there are three options. You can resize the partition by clicking “Edit partitions on the destination disk”. The “Sector by sector clone” means that it will clone every byte of the disk no matter it is used or not. It will take more space and longer time. If your are cloning Windows 8/8.1 disk to a solid state drive(SSD), you can check the box “Align partition to optimize for SSD”, because it will optimize the performance of the SSD after cloning. After settings, click “Start Clone” to launch the this process. When the process reaches 100%, clickFinish to exit. In addition, with the free Windows 8/8.1 clone software AOMEI Backupper Standard, you can finish clone for Windows 8/8.1 in a few steps. AOMEI Backupper Standard can also do many things far beyond cloning, such as backup system, check image, make bootable media, and so on. Besides, it supports almost all the Windows PC OS including Windows XP/Vista/7/8/8.1/10.